(2012.201.B0255.0038, Oklahoma Publishing Company Photography Collection, OHS). At age nineteen Emmett Evan "Van" Heflin, Jr., made his Broadway acting debut, and headlines in Oklahoma City declared, "Oklahoma City Boy Crashes Broadway." Born in Walters, Oklahoma, on December 13, 1908 (according to Social Security records), Van Heflin was the son of Dr. Emmett E. and Fannie B. Heflin. The family moved to California, and the younger Heflin attended Long Beach Polytechnic High School. When Dr. Heflin, a dentist, moved his family back to Oklahoma, they settled first in Oklahoma City and then in Norman, where Van attended the University of Oklahoma, receiving a bachelor's degree in 1932. 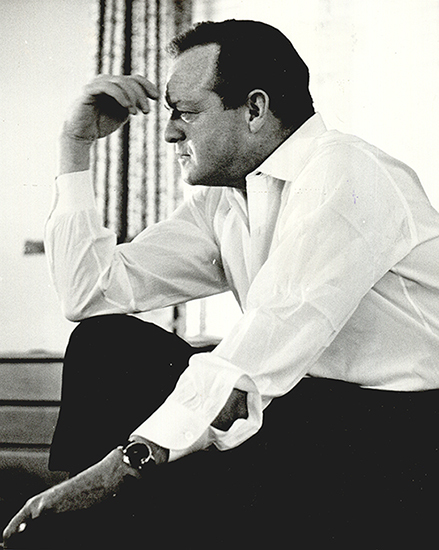 Heflin's Broadway experience came during his college years; on a trip to New York City he met director Richard Boleslawski, who cast the appealing young man in Mr. Moneypenny. Afterward, Heflin returned to college in Oklahoma. However, he later attended Yale Dramatic School and then worked in stock theater companies and on radio. In 1936 Katharine Hepburn helped him secure a role in the Metro-Goldwyn-Mayer (MGM) film A Woman Rebels. His big break came when he appeared with Hepburn in the long-running stage version of The Philadelphia Story. World War II service in the U.S. Army Field Artillery briefly interrupted his career. He returned to work for MGM and other studios after the war, finding acclaim in such vehicles as The Strange Love of Martha Ivers (with Barbara Stanwyck, 1946), Green Dolphin Street (1947), and Madame Bovary (with Jennifer Jones, 1949). In 1953 he played the taciturn Joe Starrett in the Alan Ladd movie Shane. Heflin won an Academy Award as Best Actor in a Supporting Role for 1942's Johnny Eager. British Academy Awards nominated him for Best Foreign Actor for his performance in Shane. His final film appearance came in Airport in 1969. Heflin's sister, Frances Heflin Kaplan, born in Oklahoma City in 1922, had a forty-year stage and screen career and became famous in the role of Mona Tyler, mother of Erika Kane on the daytime series All My Children. Known as "the actor's actor," Van Heflin died of a heart attack on July 23, 1971, in Hollywood. Liz-Anne Bawden, The Oxford Companion to Film (New York: Oxford University Press, 1976). Daily Oklahoman (Oklahoma City), 16 December 1928, 12 March 1940, 27 February 1953, and 23 July 1971. Oklahoma Journal (Oklahoma City), 7 June 1971. James Vinson, ed., International Dictionary of Films and Filmmakers, 4 vols. (Chicago: St. James Press, 1986). Dianna Everett, "Heflin, Emmett Evan," The Encyclopedia of Oklahoma History and Culture, https://www.okhistory.org/publications/enc/entry.php?entry=HE008.